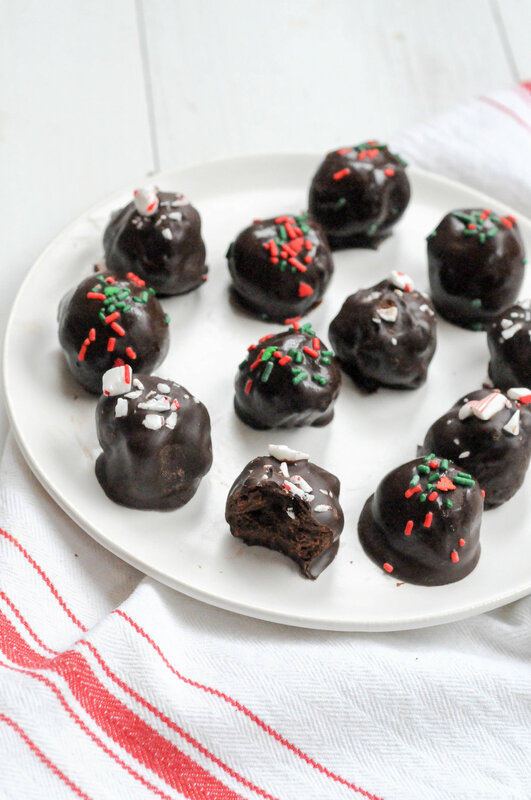 Dark Chocolate Mint Truffles — urban. apron. Need a last minute dessert to bring to your family on Christmas? Here are rich truffles with a hint of mint. If you like Thin Mint Girl Scout Cookies, you'll love the flavor of these! Or, if you don't prefer mint, leave it out! You'll have rich dark chocolate truffles that are so delicious. Place the 8 ounces of dark chocolate in a glass bowl and set aside. Place the cream in a microwave safe bowl and microwave on high for 2-3 minutes or until just boiling (but don’t boil) . Pour the hot cream over the chocolate and cover the bowl with plastic wrap. Let it sit for 5 minutes. Remove plastic wrap and whisk until chocolate is melted completely. Store in the vanilla, salt and mint extract to combine. Refridgerate until firm enough to roll into balls, about an hour or until ready to use. Once firm, use a small tablespoon cookie scoop or a spoon and roll tablespoon-sized balls of the ganache. Let balls set in refrigerator until ready to dip. Melt the 1/4 cup chocolate and oil in the microwave for 30 seconds. Stir and then microwave for 15-30 more seconds until melted. Using a fork, dip the balls into the melted chocolate to coat. Place on parchment paper and sprinkle with desired toppings. Place in freezer or fridge to harden. Enjoy!